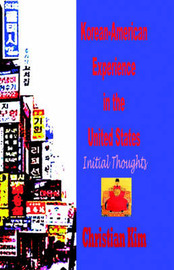 "A very exciting book on Koreans in the United States! "This book is very helpful for understanding the nature and the history of the Korean community in the USA. There are over one million Korean-Americans in the USA. Despite the small number and a short immigration history, Korean-Americans have been able to contribute to America in important ways. Korean-American students generally comprise the biggest block of ethnic minorities in Ivy League universities and other leading research universities. The current Yale University Law School Dean is Korean-American. A Korean-American has been the leader of the biggest Presbyterian denomination in the USA. Korean-Americans can be found all over the USA in every profession, and they have been very successful. And, perhaps, the Korean-American community is the most evangelical Christian ethnic community in America. In fact, many InterVarsity Christian Fellowship and Campus Crusade for Christ leaders in America's major universities are Korean-Americans. How is it that Korean-Americans came to play such an important role in the American society, particularly in the area of religion? This is a very good book to understand what makes the Korean-Americans"tick. "Particularly insightful are the ways in which Christian Kim, the author, captures general patterns for the Korean-Americans and their successes. This is by far the best introductory book on Korean-Americans in the market and will be very useful for use in classroom settings, both on the high school and college levels, in courses dealing with ethnic studies and the Asian experience in American history and society.